This cozy travel trailer is great for couples, small families, or families with young children. As you enter this unit, to your right you will find the master bedroom area with flip-up queen bed to give you more space during the day; there are also nightstands on both sides of the bed. 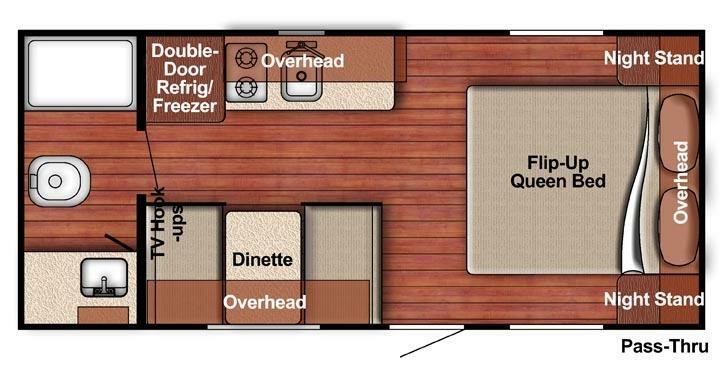 To your left is a bench dinette and across is the kitchen with a 2 burner stove, sink, 6 cu. ft. double door refrigerator, and microwave. There are also plenty of overhead cabinets to store food and cooking tools. At the rear of the unit is the bathroom with shower, foot flush toilet, and sink. Dry weight: 2996 lbs Hitch weight: 350 lbs Net carrying capacity: 854 lbs LP tank: 20 lbs Quick recovery water heater: 6 gallons Fresh water: 30 gallons Grey tank: 36 gallons Black tank: 36 gallons Width: 96" Exterior height: 9' 3" Interior height: 6' 8"